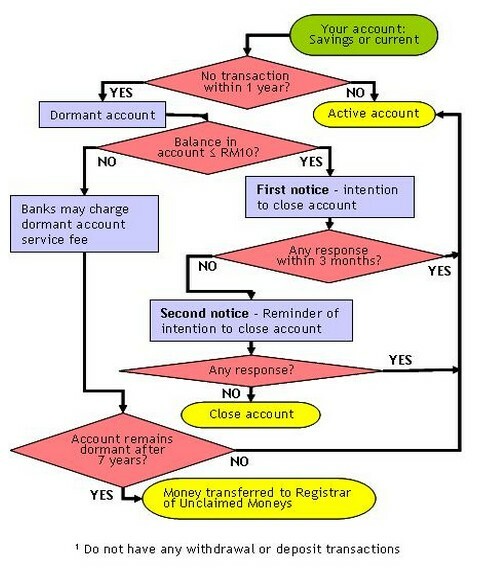 In general, banks define dormant account (sometimes referred as inactive) when an account does not have any transaction (deposit or withdrawal) for a continuous period of at least 12 months. When your account becomes dormant, the bank would send you a notice letter to the registered mailing address to remind you to activate your account. You may be required to withdrawal or deposit some money over the counter to re-activate your account. The global economy grew at a more moderate pace in 2011 after the strong rebound in 2010. The growth momentum was weighed down by continued structural weaknesses and fiscal issues in the advanced economies, geopolitical developments in the Middle East and North Africa region and the disruptive impact of natural disasters on global manufacturing production. These developments reverberated onto international financial markets and contributed to heightened market volatility throughout the year. Despite the less favourable external environment, emerging economies continued to record firm domestic-driven economic growth. At the same time, emerging economies faced increasing challenges from volatile capital flows and rising inflationary pressures. Amidst this environment, the Malaysian economy continued to grow steadily underpinned by the expansion in domestic activity and firm regional demand. Public Mutual today launched two new funds, namely Public Strategic SmallCap Fund (PSSCF) and Public Enterprises Bond Fund (PENTBF), and categorized as equity growth and bond fund respectively. Public Strategic SmallCap Fund seeks to achieve capital appreciation over the medium to long term period through investments primarily in companies with small market capitalization, by investing in stocks with market capitalization of up to RM1.25bn at the point of purchase. The fund may also invest in companies which at the point of purchase form the bottom 15% of the cumulative market capitalization of the market which the stock is listed on, although the fund will focus its investments in the domestic market. 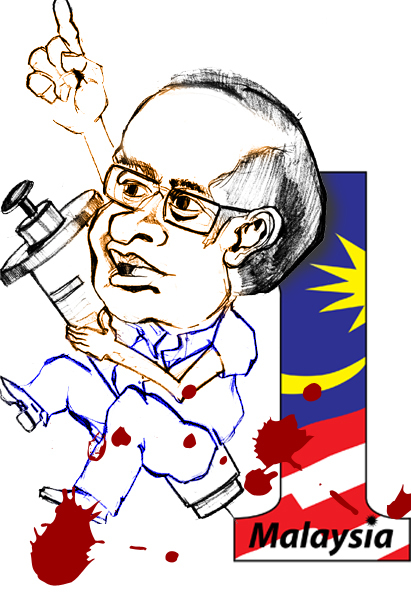 Why All of Us Must Care about 1Care Malaysia? Heard about 1Care Malaysia healthcare plan? If no, then you must read this article thoroughly word by word. Because the the proposed healthcare system will drastically change the way we seek for treatment in the future. The main issue was "Is it viable to implement 1Care?". 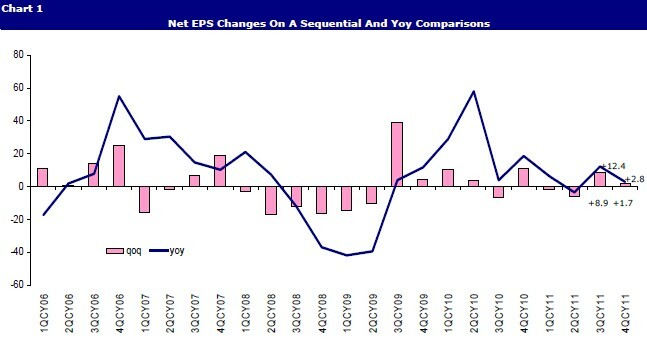 In tandem with the moderating economic growth trend, corporate earnings remained weak in 4Q 2011. Of the 113 reported earnings that we cover, 55 of the results (48.7% of the total) were within our expectations, 33 below projections (29.2% of the total) and 25 above forecasts (22.1%) (see Table 1). Against the consensus numbers, 44.2% of the reported earnings were within expectations, 38.1% below and 17.7% above projections (see Table 2). Sequentially, net EPS for the FBM KLCI stocks under our coverage weakened back to +1.7% qoq and +2.8% yoy in the 4Q, from +8.9% qoq and +12.4% yoy in the previous quarter (see Chart 1). However, the downgrade to upgrade ratio has improved significantly to 1.07 times, from 1.65 times in the previous quarter. Overall, 2011 has been a year where Corporate Malaysia suffered from slowing sales and falling utilisation rates. This, coupled with the trend of higher costs, resulted in falling margins for many companies under our coverage. Consequently, normalised net EPS growth for the FBM KLCI stocks under our coverage slowed sharply from 20.9% in 2010 to +4.7% in 2011. The sharp slowdown in EPS growth, however, partly reflected the higher base effect as well as the plunge in Tenaga’s earnings arising from the gas curtailment issue. Excluding Tenaga, our 2011’s normalised net EPS for the FBM KLCI stocks has slowed down less significantly to +10.1%, from +21.2% in 2010. While Malaysia remained a laggard compared to the rally in developed markets, the global rally that had started in January finally dragged the local bourse kicking and screaming up during February with a rally of more than 3%. Globally, markets continued to rise despite the patchy fundamental landscape. Thus, while we had anticipated a potential rally in the 1st half of February, our expected market retraction in the 2nd half failed to materialize. 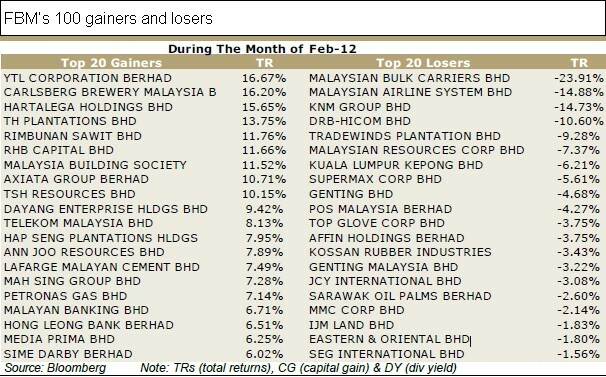 Top Gainers for February were dividend plays such as Carlsberg or companies with corporate activities such as Hartalega with its bonus issue or potential targets such as RHB Cap and MBSB. Smaller plantation companies such as TH Plantations and RImbunan Sawit also had a good run. On the flip side, companies with poor results such as Maybulk, MAS and KNM got sold down. On a broader sectoral basis, telcos were the dominant play. It was the return of the Big Caps in February as the catch-up played by the KLCI meant that big caps ran up with the inflow of foreign funds. KLCI year-end target set at 1,620 pts!! !